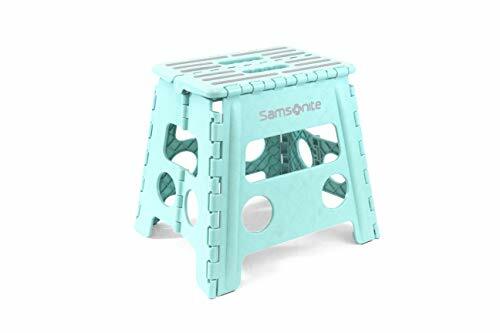 ⚫ SUPER STRONG HEAVY DUTY CONSTRUCTION- HOLDS UP TO 330 LBS: Step Stool Is Made From Super Strong, High Impact Polyethylene Construction For Long Lasting Durability That Can Effortlessly Hold Up To 330 Lbs. Will Not Collapse, Tip Over Or Wobble When Locked Properly In Place; When You Step On It Your Weight Presses Down Firmly, The Notches Stay In Place And Downwards Pressure Prevents The Walls From Caving In. Cheaper Imitations Can Crack Under Much Less Weight. All Weather Finish. ⚫ EASY TO STORE, FOLDS FLAT, LIGHTWEIGHT, CONVENIENT ONE-HANDED OPERATION: Folds Flat Into One Compact Piece, 2 " Wide, So It Can Be Stored Anywhere You Might Need It: Closet, Under The Bed Or, Under The Kitchen Cabinet Sink. Opens Easily With A Flip Of The Hand With Easy Carry Built-in Handle. The Step Stool's Handle Magically Appears When The Stool Is Folded Flat. The Entire Platform Folds Up In A Split Second With Only One Hand - Great For When You Have Your Other Hand Full. ⚫ IDEAL FOR KIDS AND ADULTS: Light Enough That Your Children Will Be Able To Comfortably Carry It Around So They Can Place It Where They Need It. Larger than Other Stepstools, Help your toddler reach the potty, or the sink to brush their teeth. Everyone In Your Family Can Use The Folding Step Stool With Confidence Because The Top Surface Is Covered With Large, Textured Discs Designed To Increase Traction. Stain Resistant And Easy To Clean, It Will Give You The Grip You Need, and Looks Great. ⚫ SAFETY RATED NON-SLIP SURFACE FOR EXTRA STABILITY: Large Enough To Put Both Feet On It, Skid Resistant Design Has Unique Anti Skid Steps With Textured Discs Surface Which Makes The Folding Step Stool Safe For Everyone Including Kids. Safety Certified And Passes Ansi Requirements. Features Large And Sturdy Plastic Steps And A Soft, Comfort Grip. The Spacious Platform Fits Your Entire Foot.